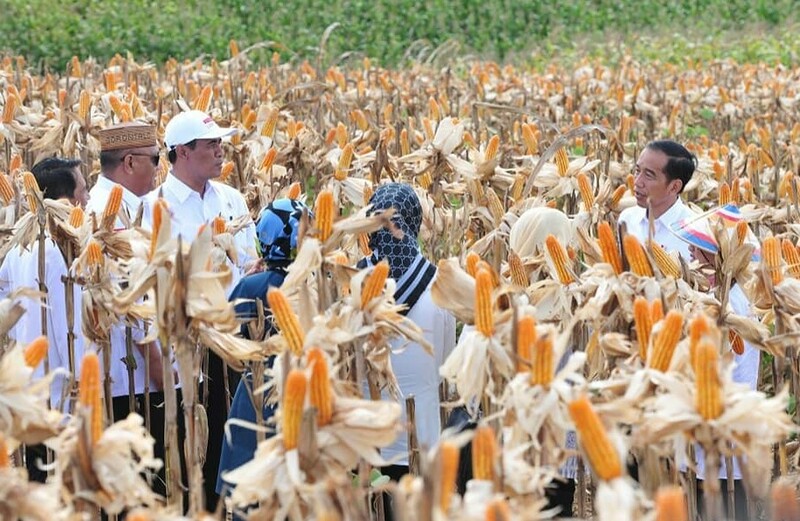 On 1st March, Indonesia President Joko Widodo and the First Lady Mrs. Iriana visited a corn farming initiative supported by a CowaterSogema local investment and economic development project in Gorontalo Province, Indonesia. As part of a series of visits, President Widodo met with farmers at the site of a corn demonstration plot supported by the project and the regional government. The visit showcased to President Widodo the significantly higher yields farmers achieved after attending training in land management. The project National Support for Local Investment Climates/National Support for Enhancing Local and Regional Economic Development (NSLIC/NSELRED) is funded by Global Affairs Canada. The group of 21 farmers supported by NSLIC/NSELRED manage the 2-hectare corn plot in the village of Botuwombato. Mahmud Mulyadi, the leader of the farmer group, is very proud of their achievement; “We really feel the benefits of the technical assistance provided by NSLIC/NSELRED and the local government to help increase our corn productivity and eventually our income. A recent visit of President Joko Widodo in Gorontalo to meet us and conduct a corn harvest is truly a surprise and quite a motivation booster. It is indeed a great source of pride for us,” said Mulyadi. The application of good agricultural practices and improved seed is the reason for the increase in corn productivity. “After applying the knowledge we gained from training in land management, our corn plot which initially only produced 6-7 tons per hectare now can produce 9.3 tons per hectare,” shared Mulyadi. During his visit, President Joko Widodo met the farmers and community before watching the corn harvest and handing over corn seeds to six farmer representatives. He emphasized the importance of corn self-sufficiency, and the need to increase corn productivity to achieve food sovereignty. “On behalf of the government, I am very grateful to the farmers and the local governments who support the national target of corn production. We know that one of the main contributors of corn production in Indonesia is Gorontalo Province. Thanks to your efforts,” Widodo said. To amplify the successful results of corn production, the NSLIC/NSELRED project and the Government of North Gorontalo district will continue to support 26 farmer groups in implementing good agriculture practices and postharvest handling. The positive results of the corn yield are already being replicated across the district; 40 farmers in North Gorontalo district are now starting to apply the same knowledge and practices on their fields. The National Support for Local Investment Climates/National Support for Enhancing Local and Regional Economic Development (NSLIC/NSELRED) Project, managed and implemented by CowaterSogema, is undertaken in partnership with the Government of Indonesia through the Ministry of National Development Planning (BAPPENAS) with the financial support of the Government of Canada provided through Global Affairs Canada. The NSLIC/NSELRED project aims to increase employment and incomes for poor men and women in Indonesia through a strengthened investment climate with more sustainable and competitive enterprises. Working with the Indonesian Ministry of National Development Planning and other core ministries, the project addresses key constraints in business regulations, promotes regional economic cooperation, supports coordinated national support to local and regional economic development, and increases access to business development services. More information is available on their website.